This is another idea for TS inspired by the TV series “Almost Human”. One episode was based around someone being killed by a home defence system. There was an obvious logical flaw here in that the computer systems in “Almost Human” (and TS, for that matter) were easily intelligent enough to distinguish between an armed home invader and a foolish youth taking a shortcut across a backyard. 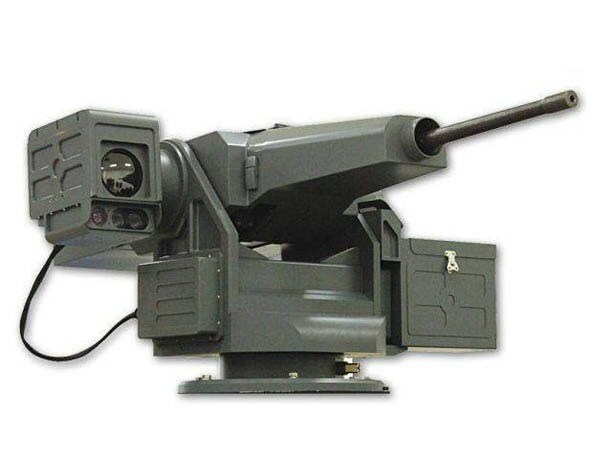 I realised that an automated static defence system such as a home defence turret would need to have a variety of force options of differing intensities. First response might be something as simple as illuminating the intruder with a spotlight. If they persist then a laser aiming spot might be projected onto them and a verbal warning made. A laser spot on the chest can be very intimidating even though the computer probably does not need such aids to aim. The defence system will begin to record and upload the incident to be used as evidence. An intruder that persists will then be fired upon with a less-lethal weapon (LLW) system such as a paint pellet gun. This would be the weapon of choice for targets such as adolescent vandals. “Painball” ammunition containing irritants such as capsaicin (OC) are available. Pellets can also contain marker dyes to make future identification of the intruder easier. Some dye compositions are also malodorous so a marked individual will also have a distinctive bad smell (HT p.171: -4 to Reaction Rolls; +4 to detect by smell by anyone within 4 yards) . Painballs: Damage 1d-3 (0.2) cr, follow up dependent on contents; Acc 1; Range 2/30; Rof 4. For the next level of force the TS arsenal has the electo-laser. These are also LLW but are more likely to cause physical injury. Microwave Area Denial (MAD) systems are probably unlikely for most home defence systems but may be used by the military or well connected or financed organizations. It is possible a determined intruder could have shielded themselves against the above measures. The final option is that of lethal force, although that may be prohibited in many jurisdictions. In order to minimise risk to one’s neighbours the system may be equipped with a limited range weapon such as a 4mm or 10mm SMG loaded with plastic ammunition. Such automated defence systems are not just limited to civilian home defence, of course. Military versions may still employ graduations in force response. In video games “sentry guns” can often be dealt with by getting close enough to deactivate them or knock them over. In real life (and TS) this may not be so simple. The military turret may include directional fragmentation charges similar to claymore mines or flame cartridges, essentially multiple single-shot flamethrowers. These would be a very nasty surprise for anyone who thinks they can sneak close enough to use a limpet mine!